As a gal with combination skin, I was incredibly cautious of applying oil on my skin to begin with. 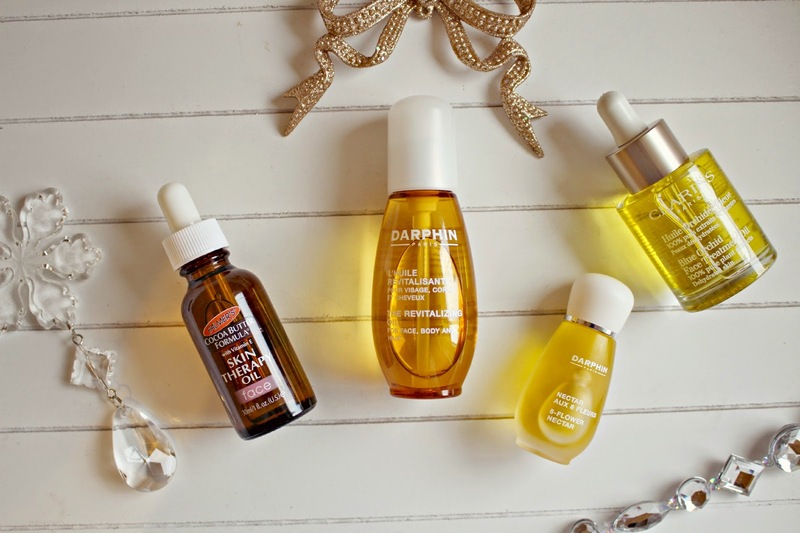 After being coaxed into trying oils by the skincare experts at Darphin, I finally gave it a go. Applying an oil has, unbelievably helped my skin become more balanced, have a healthier glow and generally a lot less stressed. 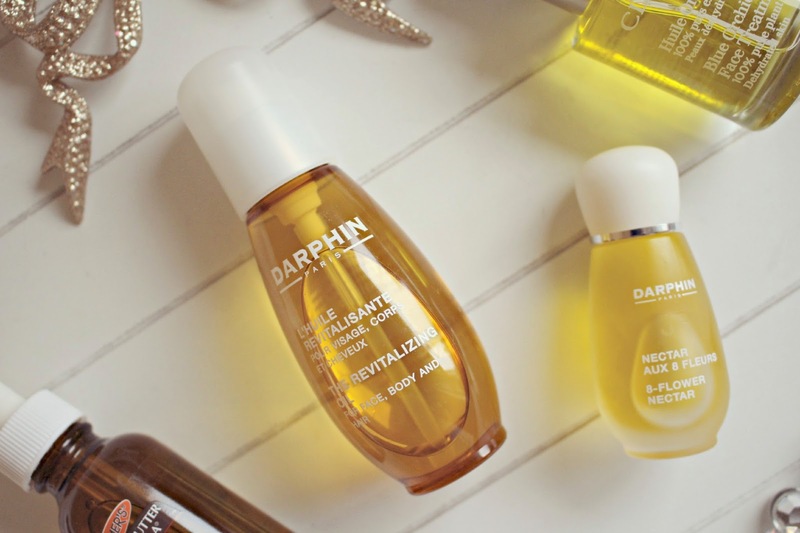 A great one to try is the Darphin Revitalising Oil (which I reviewed here!). It’s £24 for 50ml (from LookFantastic) which I think is fantastic value for such a luxury product. It’s scent is incredibly calming to inhale before bed, and you can also apply to hair to hydrate and soften. Also pictured is the super-duper luxurious 8 Flower Nectar. Now this is a major splurge, I don’t even think I can bare to share the price, so click here if you want to see! It’s an opulent, extravagant addition to your skincare routine, but daily use promises to firm and renew skin suppleness and bring youthful radiance. I have to say I’ve barely used this oil yet, but have saved it for special occasions. I used it in the week running up to New Year’s Eve as I wanted a perfect complexion, and I was treated to smooth, firm and clear skin with a glow which is usually reserved for after a week in the sun. Oils can be pricey, so if you’re a beginner to oils and want to give them a go before splashing out, then there is one oil which I’ve tried which seriously rivals it’s pricey counterparts, and can be yours for under £5. 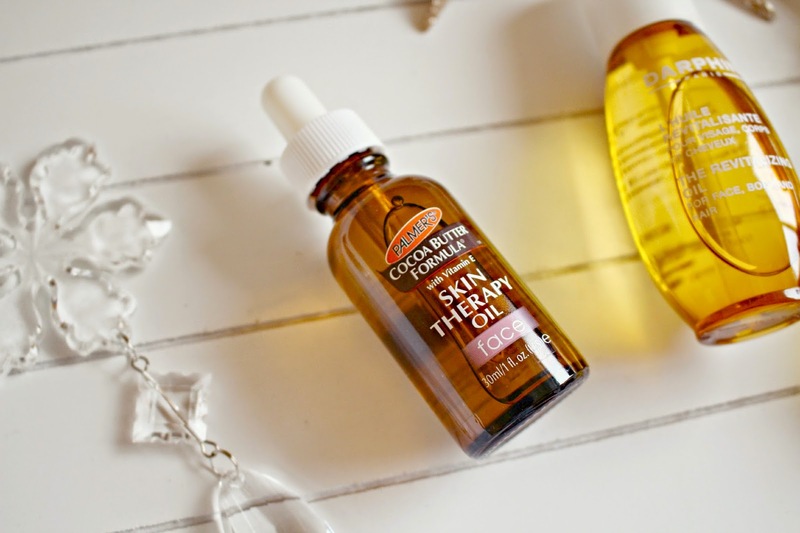 I absolutely love the Palmer’s Cocoa Butter Skin Therapy Oil. It completely chills out my skin whenever it’s feeling stressed, and also works to improve the appearance of lines and wrinkles and uneven skin tone. It has a delicate rose fragrance, and as fans of the body butter can imagine, is a blend of sumptuous oils which absorb quickly, and leave your skin glowing. I always carry one of these in my travel bag as it’s ideal for helping skin recover after a flight, and the pipette makes it the easiest of the bunch to apply when on the run. 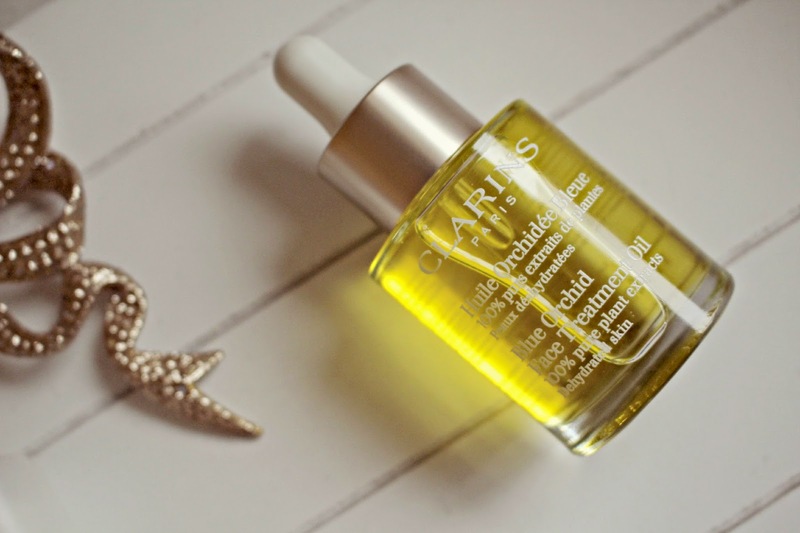 Also a lovely one for the face is Clarins Blue Orchid Treatment Oil which I reviewed here. Its opulent formula will also firm and renew skin suppleness, resilience and youthful radiance, for truly younger more beautiful looking skin. Using oils on your body has so many benefits, and each different product has unique added benefits on top of the oils nourishing powers. 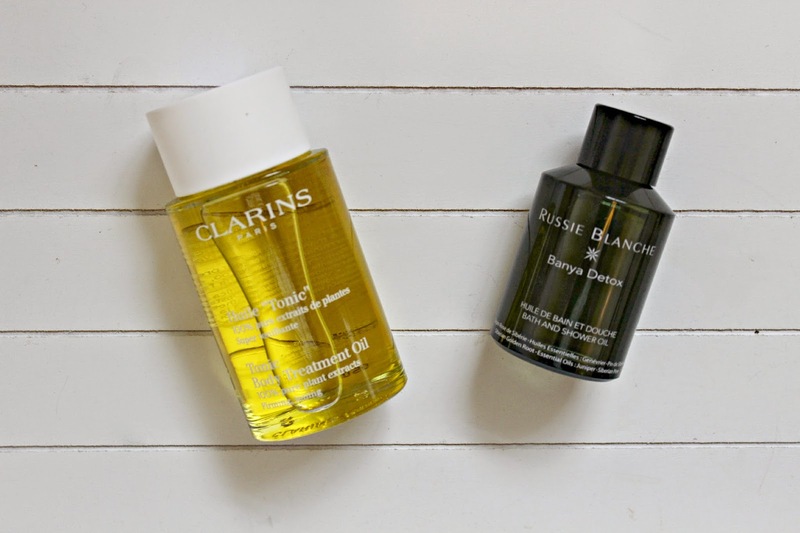 My two favourites include the Clarins Tonic Body Treatment Oil, and Russie Blanche’s Banya Detox. Both oils stimulate and soften the skin and have the added power of toning the body. The Clarins oil is made from 100% plant extracts so as you can imagine it smells incredible!! The mint within it instantly awakens your senses and the ingredients work to firm and improve skin elasticity. It’s highly recommended for those that want to smooth the appearance of stretch marks, and if you suffer from slightly dry skin, the hazelnut oil locks in moisture to leave your skin feeling silky smooth. I find a little goes a long way, so while at £39 it’s more pricey than your standard body lotions, I foresee this lasting me a long time, and the benefits are far greater than a normal lotion. The clue is in the name for the Russie Blanche Banya Detox Bath and Shower Oil! Not only does it moisturise and nourish skin, but the macadamia oil is rich in skin-loving acids which work to make the skin soft and supple. In addition, Siberian Golden Root tones skin, and other essential oil extracts work hard to detox and stimulate. It’s hard to describe the sensation when I use this oil, it’s as though my entire body is slightly buzzing, and again the fragrance is simply divine!! The oil can be applied while in the bath or shower, so I prefer using this during the colder months as there’s no need to apply additional lotion after towelling off. Have you introduced any oils into your routine?